An argument against the Five Whys and an alternative approach you can apply. Before I begin this post, let me say that this is intended to be a critique of the Five Whys method, not a criticism of the people who are in favor of using it. This critique I present is hardly original; most of this post is inspired by Todd Conklin, Sidney Dekker, and Nancy Leveson. The concept of post-hoc explanation (or “postmortems” as they’re commonly known) is, at this point, taken hold in the web engineering and operations domain. I’d love to think that the concepts that we’ve taken from the new view on “human error” are becoming more widely known and that people are looking to explore their own narratives through those lenses. I think that this is good, because my intent has always been (might always be) to help translate concepts from one domain to another. In order to do this effectively, we need to know also what to discard (or at least inspect critically) from those other domains. 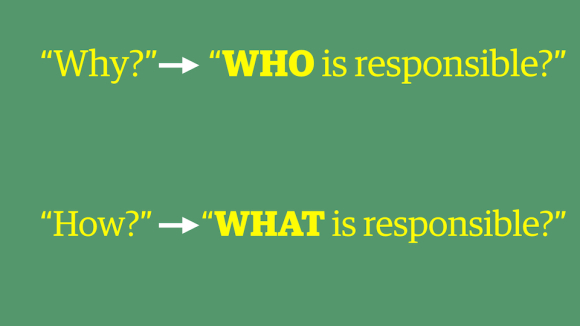 The Five Whys is such an approach that I think we should discard. This post explains my reasoning for discarding it, and how using it has the potential to be harmful, not helpful, to an organization. Here’s how I intend on doing this: I’m first going to talk about what I think are deficiencies in the approach, suggest an alternative, and then ask you to simply try the alternative yourself. Asking “how?” gets you to describe (at least some) of the conditions that allowed an event to take place, and provides rich operational data. Asking a chain of “why?” assumes too much about the questioner’s choices, and assumes too much about each answer you get. At best, it locks you into a causal chain, which is not how the world actually works. This is a construction that ignores a huge amount of complexity in an event, and it’s the complexity that we want to explore if we have any hope of learning anything. But it’s a great way to get people started! It’s only a good “first step” because it’s easy to explain and understand, which makes it easy to socialize. The issue with this is that the concepts that the Five Whys depend on are not only faulty, but can be dangerous for an organization to embrace. If the goal is learning (and it should be) then using a method of retrospective learning should be confident in how it’s bringing to light data that can be turned into actionable information. The issue with the Five Whys is that it’s tunnel-visioned into a linear and simplistic explanation of how work gets done and events transpire. This narrowing can be incredibly problematic. In the best case, it can lead an organization to think they’re improving on something (or preventing future occurrences of events) when they’re not. In the worst case, it can re-affirm a faulty worldview of causal simplification and set up a structure where individuals don’t feel safe in giving their narratives because either they weren’t asked the right “why?” question or the answer that a given question pointed to “human error” or individual attributes as causal. This is the example of the Five Whys found in the Web Operations book, as well. The answer also limits the next question that we’d ask. There isn’t any room in the dialogue to discuss things such as the potential to use a server in the wrong way and it not result in failure, or what “wrong” means in this context. Can the server only be used in two ways: the “right” way or the “wrong” way? And does success (or, the absence of a failure) dictate which of those ways it was used? We don’t get to these crucial questions. This answer is effectively a tautology, and includes a post-hoc judgement. It doesn’t tell us anything about how the engineer did use the system, which would provide a rich source of operational data, especially for engineers who might be expected to work with the system in the future. Is it really just about this one engineer? Or is it possibly about the environment (tools, dashboards, controls, tests, etc.) that the engineer is working in? If it’s the latter, how does that get captured in the Five Whys? An engineer with faulty (or at least incomplete) knowledge. If this is to be taken as an example of the Five Whys, then as an engineer or engineering manager, I might not look forward to it, since it focuses on our individual attributes and doesn’t tell us much about the event other than the platitude that training (and convincing people about training) is important. These are largely answers about “who?” not descriptions of what conditions existed. In other words, by asking “why?” in this way, we’re using failures to explain failures, which isn’t helpful. 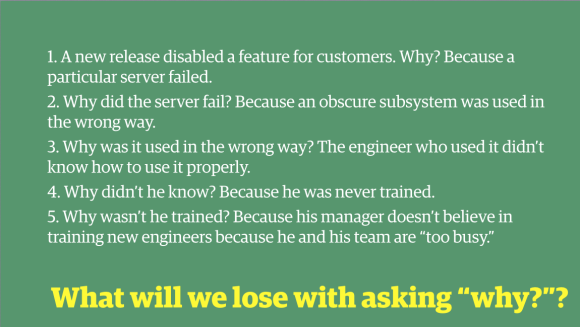 If we ask: “Why did a particular server fail?” we can get any number of answers, but one of those answers will be used as the primary way of getting at the next “why?” step. We’ll also lose out on a huge amount of important detail, because remember: you only get one question before the next step. The approach(es) they took when writing the code. What ways they gained confidence (tests, code reviews, etc.) that the code was going to work in the way they expected it before it was deployed. What (if any) history of success or failure have they had with similar pieces of code? What trade-offs they made or managed in the design of the new function? How they judged the scope of the project. How much (and in what ways) they experienced time pressure for the project. The list can go on, if you’re willing to ask more and they’re willing to give more. When we ask “how?,” we’re asking for a narrative. A story. What might we put in place so that it’s very difficult to put that code into production accidentally? What sources of confidence for engineers could we augment? As part of those stories, we’re looking to understand people’s local rationality. When it comes to decisions and actions, we want to know how it made sense for someone to do what they did. And make no mistake: they thought what they were doing made sense. Otherwise, they wouldn’t have done it. Again, I’m not original with this thought. Local rationality (or as Herb Simon called it, “bounded rationality”) is something that sits firmly atop some decades of cognitive science. 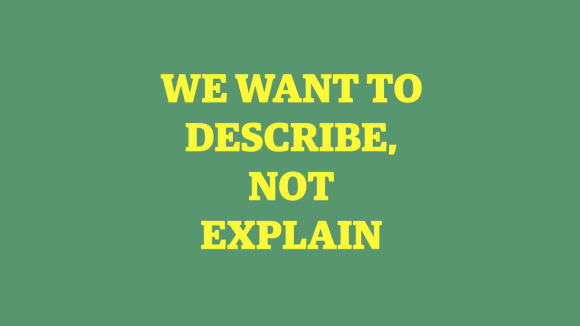 These stories we’re looking for contain details that we can pull on and ask more about, which is critical as a facilitator of a post-mortem debriefing, because people don’t always know what details are important. As you’ll see later in this post, reality doesn’t work like a DVR; you can’t pause, rewind, and fast-forward at will along a singular and objective axis, picking up all of the pieces along the way, acting like “CSI.” Memories are faulty and perspectives are limited, so a different approach is necessary. Now, read again the straw-man example of the Five Whys above. The questions that we ask frame the answers that we will get in the form of first stories. When we ask more and better questions (such as “how?”) we have a chance at getting at second stories. 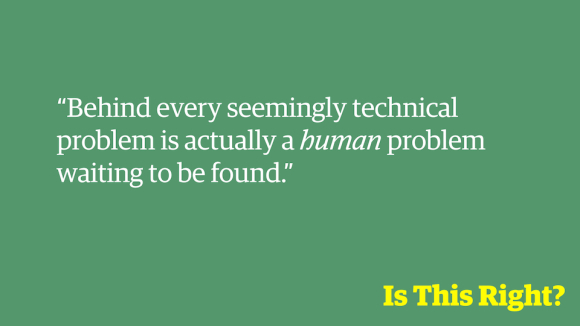 You might wonder: How did I get from the Five Whys to the topic of “human error”? Because once “human error” is a candidate to reach for as a cause (and it will, because it’s a simple and potentially satisfying answer to “why?”) then you will undoubtedly use it. At the beginning of the talk, a large number of people said yes, this is correct. Steven Shorrock (who is speaking at Velocity in Barcelona on this exact topic) has written a great article on this way of thinking: “If It Weren’t For The People.” By the end of my talk, I was able to convince them that this is also the wrong focus of a post-mortem description. The selection of events to include in an event chain is dependent on the stopping rule used to determine how far back the sequence of explanatory events goes. Although the first event in the chain is often labeled the ‘initiating event’ or ‘root cause’ the selection of an initiating event is arbitrary and previous events could always be added. “Sometimes the initiating event is selected (the backward chaining stops) because it represents a type of event that is familiar and thus acceptable as an explanation for the accident or it is a deviation from a standard . In other cases, the initiating event or root cause is chosen because it is the first event in the backward chain for which it is felt that something can be done for correction. “The backward chaining may also stop because the causal path disappears due to lack of information. Rasmussen suggests that a practical explanation for why actions by operators actively involved in the dynamic flow of events are so often identified as the cause of an accident is the difficulty in continuing the backtracking “through” a human . Learning is the goal. Any prevention depends on that learning. So if not the Five Whys, then what should you do? What method should you take? Ask people for their story without any replay of data that would supposedly “refresh” their memory. Tell their story back to them and confirm you got their narrative correct. Progressively probe and re-build how the world looked to people inside of the situation at each juncture. What knowledge was used to deal with the situation? Did participants have any experience with similar situations that was useful in dealing with this one? What expectations did participants have about how things were going to develop, and what options did they think they have to influence the course of events? How did other influences (operational or organizational) help determine how they interpreted the situation and how they would act? Cues What were you seeing? What were you focused on? Interpretation If you had to describe the situation to your colleague at that point, what would you have told? Errors What mistakes (for example in interpretation) were likely at this point? Previous knowledge/experience Were you reminded of any previous experience? Did this situation fit a standard scenario? Were you trained to deal with this situation? Were there any rules that applied clearly here? Did any other sources of knowledge suggest what to do? Goals What were you trying to achieve? Were there multiple goals at the same time? Was there time pressure or other limitations on what you could do? Taking Action How did you judge you could influence the course of events? Did you discuss or mentally imagine a number of options or did you know straight away what to do? Outcome Did the outcome fit your expectation?Did you have to update your assessment of the situation? Did you make use of more than one communication channels at once? Help Did you ask anyone for help? What signal brought you to ask for support or assistance? Were you able to contact the people you needed to contact? I have tried to outline some of my reasoning on why using the Five Whys approach is suboptimal, and I’ve given an alternative. I’ll do one better and link you to the tutorials that I gave in New York in October, which I think digs deeper into these concepts. This is in four parts, 45 minutes each. My request is that the next time that you would do a Five Whys, that you instead ask “how?” or the variations of the questions I posted above. If you think you get more operational data from a Five Whys and are happy with it, rock on. If you’re more interested in this alternative and the fundamentals behind it, then there are a number of sources you can look to. You could do a lot worse than starting with Sidney Dekker’s Field Guide To Understanding Human Error. For those readers who think I’m too unnecessarily harsh on the Five Whys approach, I think it’s worthwhile to explain why I feel so strongly about this. Retrospective understanding of accidents and events is important because how we make sense of the past greatly and almost invisibly influences our future. At some point in the not-so-distant past, the domain of web engineering was about selling books online and making a directory of the web. These organizations and the individuals who built them quickly gave way to organizations that now build cars, spacecraft, trains, aircraft, medical monitoring devices … the list goes on … simply because software development and distributed systems architectures are at the core of modern life. The software worlds and the non-software worlds have collided and will continue to do so. More and more “life-critical” equipment and products rely on software and even the Internet. Those domains have had varied success in retrospective understanding of surprising events, to say the least. Investigative approaches that are firmly based on causal oversimplification and the “Bad Apple Theory” of deficient individual attributes (like the Five Whys) have shown to not only be unhelpful, but objectively made learning harder, not easier. As a result, people who have made mistakes or been involved in accidents have been fired, banned from their professions, and thrown in jail for some of the very things that you could find in a Five Whys. I sometimes feel nervous that these oversimplifications will still be around when my daughter and son are older. If they were to make a mistake, would they be blamed as a cause? I strongly believe that we can leave these old ways behind us and do much better. My goal is not to vilify an approach, but to state explicitly that if the world is to become safer, then we have to eschew this simplicity; it will only get better if we embrace the complexity, not ignore it. The Five Whys approach follows a Newtonian-Cartesian worldview. This is a worldview that is seductively satisfying and compellingly simple. But it’s also false in the world we live in. First, it is reductionist. The narrative built by the Five Whys sits on the idea that if you can construct a causal chain, then you’ll have something to work with. In other words: to understand the system, you pull it apart into its constituent parts. Know how the parts interact, and you know the system. The identification of a root cause means that the analysis has found the source of the event and so everyone can focus on fixing the problem. This satisfies people’s need to avoid ambiguous situations in which one lacks essential information to make a decision (Frisch & Baron, 1988) or experiences a salient knowledge gap (Loewenstein, 1993). The seductiveness of singular root causes may also feed into, and be supported by, the general tendency to be overconfident about how much we know (Fischhoff, Slovic,& Lichtenstein, 1977). That last bit about a tendency to be overconfident about how much we know (in this context, how much we know about the past) is a strong piece of research put forth by Baruch Fischhoff, who originally researched what we now understand to be the Hindsight Bias. Not unsurprisingly, Fischhoff’s doctoral thesis advisor was Daniel Kahneman (you’ve likely heard of him as the author of Thinking Fast and Slow), whose research in cognitive biases and heuristics everyone should at least be vaguely familiar with. The third issue with this worldview, supported by the idea of Five Whys and something that follows logically from the earlier points is that outcomes are foreseeable if you know the initial conditions and the rules that govern the system. The reason that you would even construct a serial causal chain like this is because the fourth part of this is that time is irreversible. We can’t look to a causal chain as something that you can fast-forward and rewind, no matter how attractively simple that seems. This is because the socio-technical systems that we work on and work in are complex in nature, and are dynamic. Deterministic behavior (or, at least predictability) is something that we look for in software; in complex systems this is a foolhardy search because emergence is a property of this complexity. And finally, there is an underlying assumption that complete knowledge is attainable. In other words: we only have to try hard enough to understand exactly what happened. The issue with this is that success and failure have many contributing causes, and there is no comprehensive and objective account. The best that you can do is to probe people’s perspectives at juncture points in the investigation. It is not possible to understand past events in any way that can be considered comprehensive. Here is a thought exercise: what if we were to try to use the Five Whys for finding the “root cause” of a success? Why didn’t we have failure X today? Now this question gets a lot more difficult to have one answer. This is because things go right for many reasons, and not all of them obvious. We can spend all day writing down reasons why we didn’t have failure X today, and if we’re committed, we can keep going. So if success requires “multiple contributing conditions, each necessary but only jointly sufficient” to happen, then how is it that failure only requires just one? The Five Whys, as it’s commonly presented as an approach to improvement (or: learning? ), will lead us to believe that not only is just one condition sufficient, but that condition is a canonical one, to the exclusion of all others. Dekker, S. (2004). Ten questions about human error: A new view of human factors and system safety. Mahwah, N.J: Lawrence Erlbaum. Hollnagel, E. (2009). The ETTO principle: Efficiency-thoroughness trade-off : why things that go right sometimes go wrong. Burlington, VT: Ashgate. Leveson, N. (2012). Engineering a Safer World. Mit Press. Article image: infinite staircase? (source: Alexandre Duret-Lutz).